Ruby and her colt (Gem), arrived from a NV feedlot on May 28, 2011. Ruby was very thin and in poor condition, as she was depleting herself to provide for Gem. Her teeth were in very poor condition, with large quids (clumps of partially chewed hay) falling from her mouth. With dental care, nutrition, and all the other needed attention, Ruby regained her health. While she was untouchable when she arrived, Ruby has learned to trust and can perform basic groundwork skills; however, she is very timid with humans and needs a gentle, quiet hand. She has not been started under saddle. 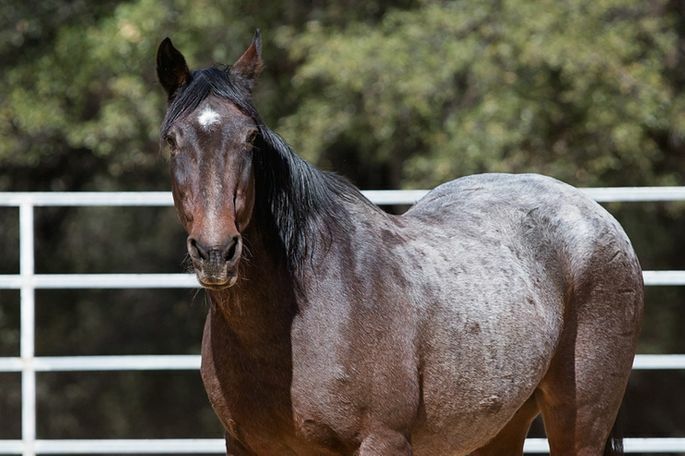 With her calm but timid nature and older age, Ruby is best suited as a companion horse to groom and love on. She is current with vaccines, deworming, and hoof and dental care.